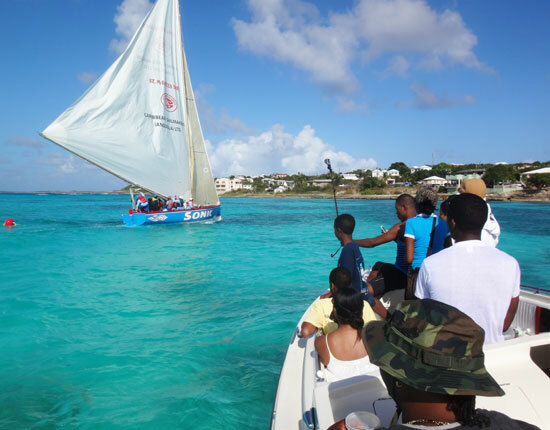 Of those who've visited the British Overseas Territory island of Anguilla as a vacation destination and have fallen in love with it, many of us like to keep it quiet. I have been in those shoes too. I've met those who take that baton and discretely carry it, hoping to not ever have the little known paradisiacal island they found so perfect to ever be spoiled by exposing it to the masses. Would you believe that one Anguillian man could blow that plan for secrecy right out of the water? 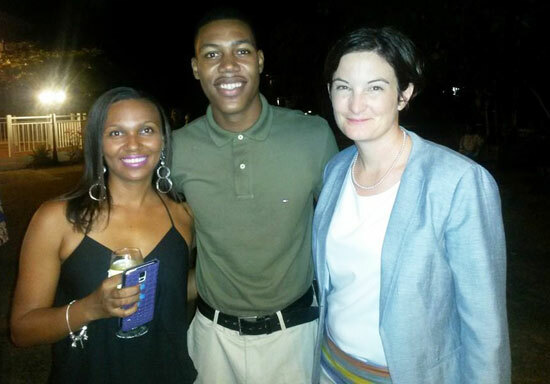 Young Anguillian man, Zharnel Hughes has already been flirting with exposing Anguilla on a larger stage. Side note for those who seriously keep Anguilla's amazing secret to yourselves: Never fear, Anguilla's intentions are to maintain its quiet, exclusive and special nature. No casinos, no fast food, no jet skis, no massive cruise ships. No harm in enlightening more people to this friendly and peaceful island, filling its existing villas and hotels, after all, sharing is caring and Anguilla's economy survives on tourism. 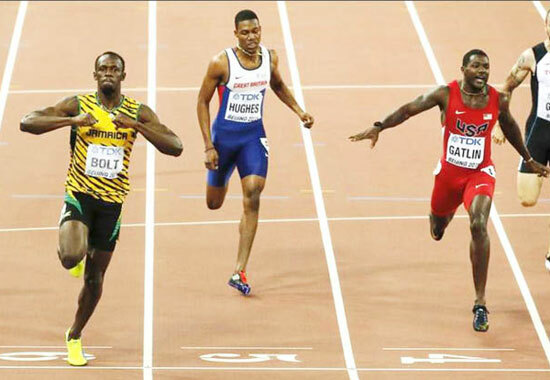 He's a record-breaking sprinter who in early 2015, came extremely close to beating the world champion Usain Bolt, a man currently deemed the "fastest person ever". He's working hard to maintain and fine tune his given natural abilities. He's as humble as can be and he's a very nice guy who will tell you that he wouldn't be where he is without some vital early supporters, including his own family. They keep him motivated and inspired to do better. He'll tell you that his family is his strength. His parents give him roots in Anguilla and Jamaica. Born in Anguilla, his love for his Caribbean island home is deep and the thought of bringing attention to and sharing the little known special place with the world makes him feel good, too, as tourism is currently its vital industry. From his early barefoot races with his father (whose family is made up of athletes), cousins and brothers on the beach in Sandy Ground, his gift was a standout - he would win. 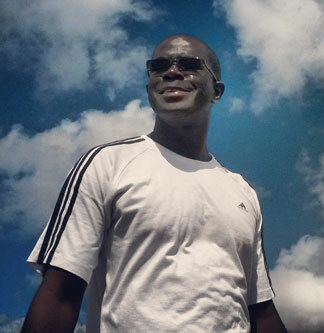 Without conventional running shoes, at the age of 10 he began track & field with Coach Collin at Anguilla's Stoney Ground Primary School, (now called Orelia Kelly Primary School and known by visitors as the "pink school") and quickly moved up to compete with runners older than him, winning legions of medals along the way. Recognizing and respecting Zharnel's potential, Valley Primary School coach Lexus Ryan invited Zharnel to run for the Anguilla National team. Lexus Ryan also provided Zharnel with his first pair of "spikes". Zharnel still remembers the details of those shoes like the back of his own hand. They were red and blue "zips" from a local shop called Tackle Box. 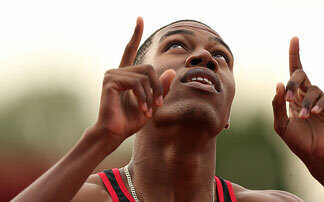 His coaching foundation provided by Lexus Ryan and Winston Duncan had begun to shape and form Zharnel's raw talent. 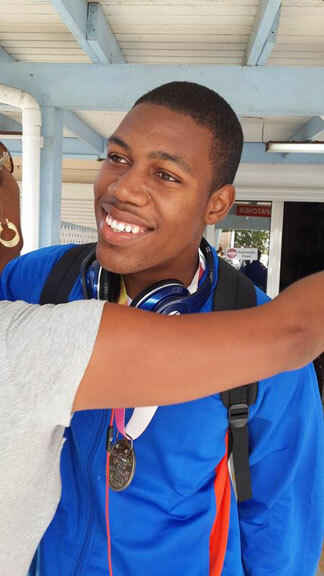 Continuing on through high school, they groomed him to travel and compete in track and field sprinting events around the Caribbean where he won medals and broke records in the 100 and 200 meters. 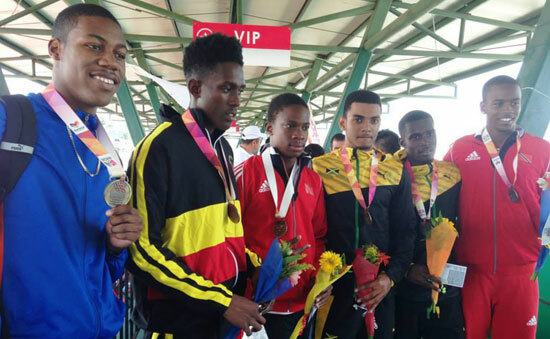 Zharnel's abilities didn't go unnoticed as he was awarded a scholarship to the International Amateur Athletic Federation (IAAF) Regional High Performance Training Centre in Jamaica. This move put Zharnel in training with the Racers Track Club, a specialized sprinters training group that includes the champion sprinter deemed the "world's fastest man", Usain Bolt. 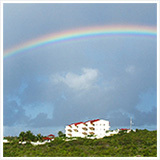 Jamaica has served as an excellent sequential training ground to his foundation in Anguilla. 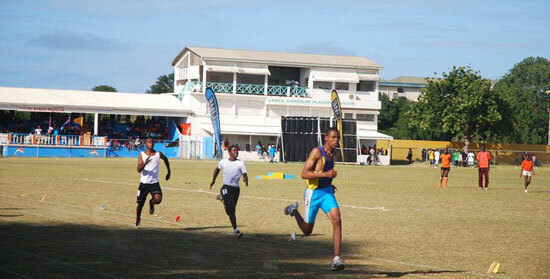 In further fine-tuning his skills Zharnel kept busy, competing in the ISSA Boys and Girls Championships representing Kingston College. 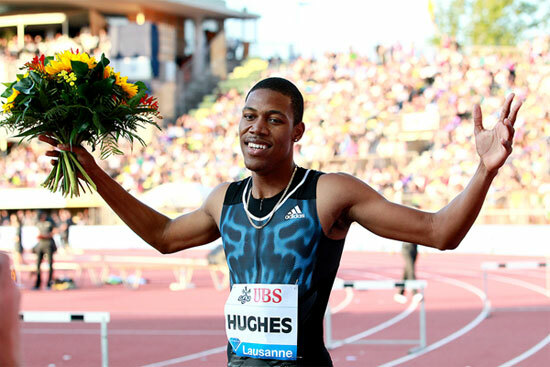 He also became a participant of the IAAF Diamond League which is an organization holding a series of of track and field meets each year across the world. 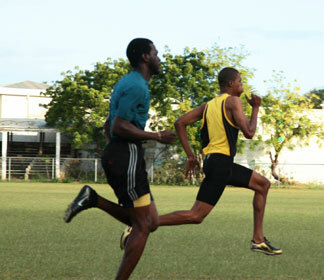 The Anguilla Amateur Athletics Federation (AAAF) is a National federation member of IAAF. Zharnel gives much credit to AAAF's current Vice President and coach Winston Duncan for his successes as he has "really worked with" Zharnel over the years and continues to. 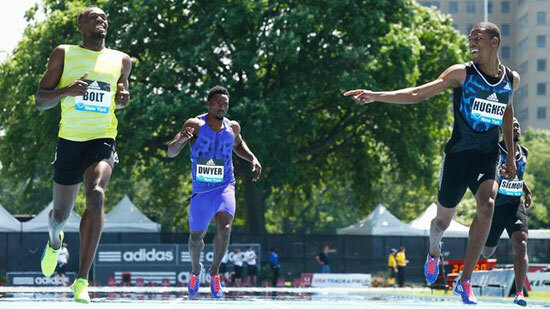 Zharnel's initial IAAF Diamond League meet in New York is where he caught further attention by nearly beating Usain Bolt in the 200m. He then went on to begin competing for Great Britain as Zharnel's home island of Anguilla is an British overseas territory not represented in the Olympics. 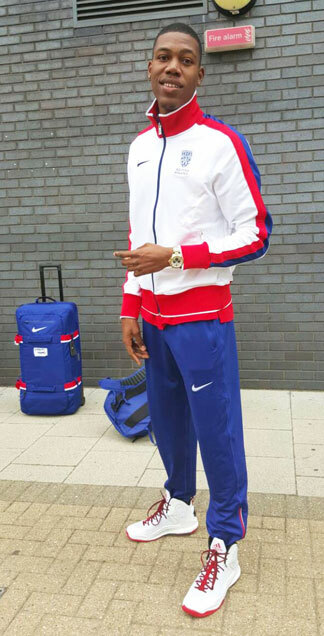 Not forgetting his roots and proudly wearing Great Britain's uniform, Zharnel's most recent accomplishment for himself, Anguilla and Great Britain was achieved at the IAAF World Championships in late August 2015 in Beijing, China. 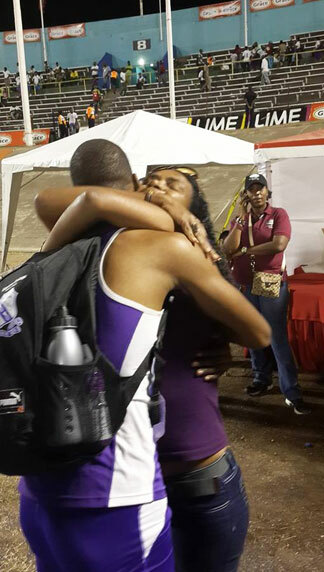 After Zharnel finished the semi-final and the final qualifiers had been assigned their lanes, I messaged Zharnel's beloved cousin and manager, Kareen Campbell-Carty and asked her if Zharnel had a preferred or favorite lane. She replied, "4-6". After reading her message, I glanced back at the newly published lanes just to confirm, yes, Zharnel was going to be in lane 5! Perfect! Then I noticed that his lane might be considered a pressurized one because lane 5 placed him in between the world leader, Jamaica's Usain Bolt and a gold medalist from the USA, Justin Gatlin! I was further impressed to think of this young man from a small island, across the world in China's capital and competing in between such greats… What must that be like? Zharnel takes everything in stride. He's not boastful and has obviously found success in continuing to improve upon himself. What Zharnel did during that 200m final on August 27th, 2015 in Beijing, was incredible. He broke his own "personal best" time by running a 20.02 in a very competitive and intense race. Having just spoken with Zharnel a week prior while he was still in England and before his travels to Asia, he had shared with me his personal goal of wanting to "break 20". He told me he was running really fast in training and for someone who is nicknamed, "Swift", you know that must be really fast. His performance at the World Championships and more recent events prior, at only 20 years of age, is an accomplishment to behold. It only further displays the endless possibilities of what Zharnel will continue to do in the future and he almost broke 20 already. Such accomplishments, naturally, must demand physical discipline and so I asked him if he had a strict regiment for diet and exercise. His response wasn't as rigid as I would have thought for someone training at such a high level. 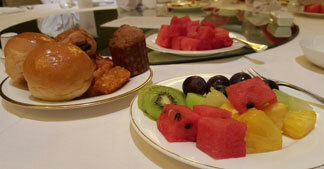 He said he eats what he wants but keeps it healthy and shoots for 4 well-balanced meals a day. I asked if he had any weakness in that regard and learned that chips and KFC might be considered one of his junkier indulgences but one that doesn't happen often. To keep in proper shape for the demands of his event, training consists of time in the gym, stretching, work outs at the track, work outs at home and the only part I was envious of… massages. Understandably, much needed, regular massage is a part of maintaining a high performance body. When you push yourself in training, you're pushing muscles further and their recovery is important. Zharnel bragged on the masseuse that is assigned to him as well as those he encounters while on the road. When I asked if he had a troubled area in training he said he has to work harder on his hamstrings since they are weak and his low back can be tight sometimes. 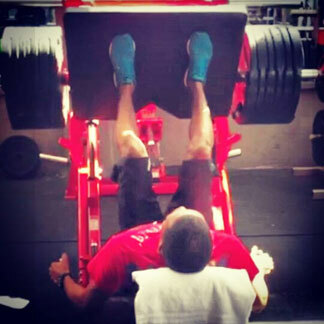 His weak hamstrings and tight low back didn't seem to slow him down at that particular time since he competed faster than he had before and in front of a huge crowd at China's National Stadium, the unique and somewhat intimidating-looking Bird's Nest - a cool venue indeed. Imagine the possibilities for this young man if he's already doing so well with challenges and his easy-going approach will likely allow for longevity. Duly noted: Zharnel likes to go fast! 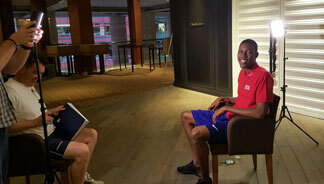 Before retirement and meeting his athletic goals, never heavily marketed to date, he likes the idea of helping to boost tourism to his special and gorgeous home island of Anguilla. He plans to retire from competitive sprinting around age 29 or 30. He actually has no intention of slowing down, yet going faster as his next goal is to become a commercial pilot as it's an interest he's had for a while. He'd also like to own an aviation company. To appease those flying desires until his schedule allows, he spends some of his free time using Microsoft's Flight Simulator X. It's a good thing Zharnel likes to fly and travel because he's going to be doing plenty of it. Although he doesn't enjoy a long flight, he's always happy to get home to Anguilla and mostly to his family. 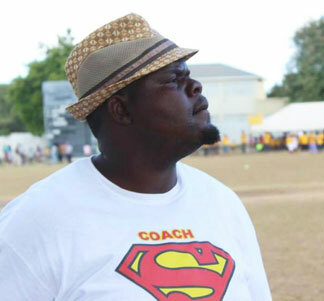 His family has talents beyond athleticism too… his brother is the lead of an award-winning local soca band called Pantha Vibes International (aka PVI). His brother, Pantha, got that name because he was such a fast runner in his youth as well. With speed being a common denominator, his cousin Kareen's husband and in-laws are the founders and owners behind Rebel Marine, Anguilla's high-quality and custom boat builder for both local use and export and their boats are also fast. 1) Go to the beach. 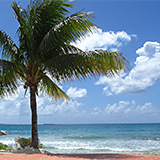 His favorite beaches in Anguilla are Sandy Ground and Rendezvous. While based in Jamaica, the closest beach to him is still 45 minutes away and without meaning to slight Jamaica's beauty, he'll tell you that Anguilla's beaches are the best. 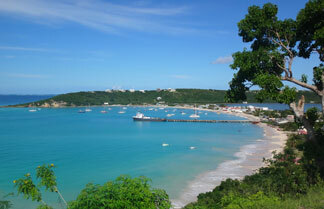 Sorely missed, upon arrival back in Anguilla you'll promptly find Zharnel headed to a pristine Anguilla beach. 2) Be at home with his family. If he's not at home with his family, he likes to go out on his cousin's fast boat the Rebel Rowser, of course with family, and of course, joking and laughing and creating more happy family memories. Zharnel shared with me that he feels his family when he's away and running in a competition. When Zharnel ran well in his first Diamond League meet in New York in 2015 against the worlds' fastest, Usain Bolt, the video of his family reacting to that race as they watched him is something that he keeps close and replays as use for motivation beyond his own self-motivation. It makes him so happy to see his family get excited and be proud and its a treasure. I gather that is one of Zharnel's biggest personal rewards so far. I could list all of his awards and records but it's already a long list. He's an Adidas-sponsored athlete too. Now that's a solid brand to be proud of too. What you'll find are stories of achievement and successes and even a little triumph in support amidst adversity. He's simply yet extraordinarily an even-keeled, young man who has a very clear picture of what he wants to accomplish and so far has approached it all with hard work, grace and gratitude. Living in his home island of Anguilla, I see witness the pride and this appears to be only the beginning for Zharnel and his fans here. What a fun and fast ride! The non-credited images are courtesy of Zharnel along with two personal shots of mine. Thank you to Zharnel for his time and candor.